(Nanowerk Spotlight) Monitoring cell functions and cell-to-cell communication has enormous implications for cell biology, regenerative medicine and tracking the fate of transplanted cells in cell therapy. Unfortunately, probing what cells 'see' and how they respond in real time to surrounding signals (i.e. cytokines) has been a major challenge. Now, a simple cell-surface sensor platform that permits signalling to be monitored within the cellular environment, in real time, in vitro and most likely also in vivo, can potentially address this problem. 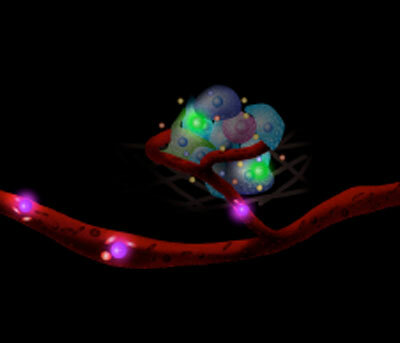 Researchers from Brigham and Women's Hospital, Harvard Medical School, Massachusetts General Hospital, MIT, and the Harvard Stem Cell Institute, have developed a platform technology where cell-surface immobilized nanosensors allow them to monitor the cellular nano environment and cell-cell communication in real-time, at a single cell level and with potential unprecedented spatial and temporal resolution. Previous techniques, including ELISA, only measure signaling molecules in bulk under static condition, which therefore fail to monitor what cells sense in real time, in a dynamic manner. ELISA is also an in vitro technique that requires many cells to obtain relevant concentrations to detect. "Our technology enables monitoring of cell signaling in real time, at a high spatio-temporal resolution, at the single-cell level is therefore significant because cells respond to cues in their niche in both time and space" Jeffrey Karp, Assistant Professor of Medicine and Co-Director of Regenerative Therapeutics at the Department of Medicine, Brigham and Women's Hospital/Harvard Medical School, explains to Nanowerk. "We also demonstrated the potential to deliver cells with immobilized sensors to monitor niches in vivo." The team describes their simple, generic approach in the July 17, 2011 online issue of Nature Nanotechnology ("Cell-surface sensors for real-time probing of cellular environments"). Sensing the niche – Cells carrying sensors monitor the cellular nano-environment in real-time. By attaching aptamers – single-stranded oligonucleotides that can be generated for a target molecule by an in vitro selection process with high affinity – that recognize the platelet-derived growth factor (PDGF) onto the membrane of mesenchymal stem cells (MSCs), the researchers engineered two types of sensors: a quench sensor and a FRET sensor; both of which showed robust performance in the presence of divalent metal ions. To enable binding to the cell surface, Karp's team engineered the aptamer sensor to have a surface anchoring moiety. The simple chemistry approach used by the scientists to attach sensors on the cell membrane bypasses the complex genetic, enzymatic or metabolic engineering approaches used previously for modifying the cell surface. "The aptamer cell surface sensor allows us to understand signaling between cells and interactions with drugs in great detail that should have broad implications for basic science drug discovery and diagnostics," says Karp. "Moreover, cell surface tethered sensors allow us to track and potentially monitor the environment surrounding transplanted cells, in real time, which was never before possible." This would be useful for developing a deeper understanding of signaling events that define a site of inflammation for example or the stem cell niche, which may have implications for treatment of many diseases. Specifically, as Karp points out, scientists could now immobilize sensors on the surface of hematopoetic stem cells (HSC) and then transplant them – they naturally home to the hematopoetic stem cell niche in the bone marrow, which is amendable to intra-vitral microscopy – so now they can explore cell signaling in the HSC niche in real-time at the single cell level in vivo. "As far as I am aware, I don't think that there are other methods available to target sensors to specific locations in the body" Dr. Weian Zhao, first author of this work. As a first step towards using cell surface sensors to monitor the cellular environment, cell function and intercellular signalling in vivo, Karp and his collaborators tested the feasibility of using intravital confocal microscopy (IVM) to monitor the engineered cells after transplantation. To examine if aptamer conjugation affects the natural homing ability of MSC to bone marrow, they simultaneously injected both native and aptamer MSC into mice, and then performed bone marrow imaging 24 hours after the injection. Using a fluorescence confocal and multiphoton intravital imaging system that tracks single cells in living animals, they observed 30 cells per image stack for both sensor-engineered MSCs and native MSCs. "The transendothelial migration of aptamer?MSC and unmodified MSC was not statistically different" says Karp. They then designed a simple FRET-probe to see whether they could sense a change in FRET signal in a live mouse's bone marrow. The positive outcome of this experiment clearly suggests that it is feasible to use IVM to track transplanted sensor-engineered cells and monitor their signalling with the target molecules in their in vivo niche environment. The team are already engineering their next generation of sensors which should possess high stability and signal/noise response in physiological settings, and are utilizing their method to study how transplanted stem cell home, respond and repair an injured tissue or interact with inflammatory and tumor cells. Karp notes that the team's long-term goal is to build a toolkit that biologists use routinely for multiplex probing cell niche and cell signaling pathways in vitro and in vitro. "This new study takes a significant step toward the goal to eavesdrop in real-time and at high spatial resolution on communications between cells in their native environment, with far-reaching implications for the development of new drugs and diagnostics" said Ulrich von Andrian, the Mallinckrodt Professor of Immunopathology at Harvard Medical School who was not involved in this study.